According to legend, Gojoseon, the first Korean kingdom, was founded in 2,333 BC by Dangun (Tangun). The earliest recorded version of the Dangun legend appears in the 13th century Samguk Yusa ( a collection of legends, folktales, and historical accounts relating to the Three Kingdoms of Korea) In the legend, Hwanin, the heavenly king, had a son, Hwanung, who wished to live on earth. On October 3, every year, the people of South Korea observe a very special occasion known as Gaecheonjeol which when translated means "the day the heavens open." It is also popularly referred to as the National Foundation Day. He descended to earth with 3,000 followers to Baekdu mountain under a sandalwood tree in modern day North Korea and set up a kingdom there . There was a bear and tiger in this land that wished to be human, and prayed to Hwanung for this wish. Hwanung gave them 20 cloves of garlic and a bunch of mugwort and told them to only eat this and stay out of the sun for 100 days. The tiger and bear retired to a cave, but the tiger was impatient and left early .The bear stayed and turned into a woman .This woman prayed to Hwanung for a son, who granted her wish and she gave birth to Dangun, who became the first human king on the peninsula and established his capital at Wanggom (Pyongyang) in 2333 BC and called his kingdom Chosun, meaning 'Morning Calm. 'Later he moved his capital to Asadal, where he ruled until 1122 BC. In 1122 BC he took a spiritual form and a second legendary king, Kija, took over . 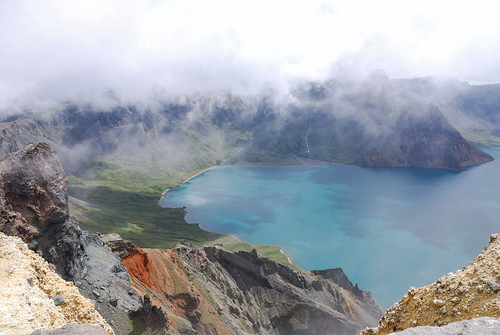 This myth is similar to creation myths among the Ainu and tribes of central Asia . 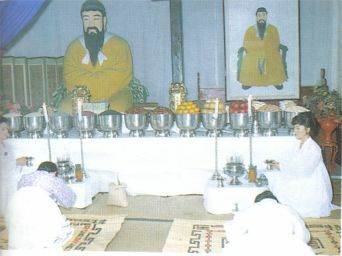 The early leaders of the Old Choson walled city state occupied the Taedong river basin in the Pyongyang area and its early leaders bore the title dangun wanggom, which is thought to have combined political and religious functions in one person .To enhance their authority, it was said they had descended from Hwanin, the heavenly king or sun god . In the 1990s, North Korea claimed it had found and excavated parts of the Mausoleum of Dangun in Kangdong near Pyongyang. Scholars outside of North Korea are generally skeptical of the dating methods and the extent of renovations, since the government has not permitted independent access and testing.North Korea also claimed they found evidence proving Kim Il sung was a descendant of Tangun.